Two Bears Farm and the Three Cubs: Best Iced Brownies Ever! My Favorite Brownie Recipe. Best Iced Brownies Ever! My Favorite Brownie Recipe. It's not that I'm a total brownie expert, but I do love them. I've made many a brownie recipe from scratch, but the following is my absolute favorite. It comes from my Baylor Homecoming cookbook. Cream together sugar and margarine. Add eggs and beat well. Add vanilla, then stir in remaining ingredients. Spread in a greased 9x13 pan. Bake at 350* for 30 minutes. Cool. 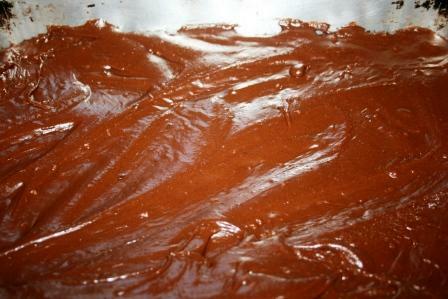 Spread icing on brownies. Mix the first 5 ingredients in a medium saucepan until margarine melts and all is combined. Cool slightly. Stir in powdered sugar and vanilla. Frost immediately. Yum! I'll try these out on a brownie addict friend! These would be wonderful with a tall glass of sweet tea. I love a good brownie, and a good iced brownie is even better! I love brownies, and so do the girls; I'll make these the next time they're over. Brownies are Gods way of showing us his love. Oh yum! I'm printing this out, can't wait to try it! Especially the frosting!! When I was a kid my mom used to make frosted brownies. As adults we have asked her a million times for the recipe but she lost it. How awesome would it be if this were close to the same? Thanks! Mmm, those sound so good! I love brownies and iced are even better - but I try not to eat too many! Oh my. I think I've gained 1/2 lb. from looking at the picture. This looks yummy….you have a lovely blog… You have so many wonderful browni recipe.I have bookmarked you blog and some recipe from that to try.